"I AM STRONGER THAN MY PAIN...Living In Hope"
Together we rise up because while we are Strong...Together we are Stronger...today you see a person in pain, but we see the possibilities of what a happy peaceful healthy future can be! Be Strong in all your encounters with life. Face the world with courage for the road of life twists and turns and no two directions are ever the same. Yet our lessons come from the journey, not the destination.” Each journey this semester is determined by your past, your present, and your hopes for the future. Learning is not an end product; though our journey together does have a final destination. Alone we are Rare but Together we are Stronger! Many day and nights I have cried out in pain feeling alone, angry and frustrated with no understanding but in my mind and my heart screams..."Never Give Up for your are truly Stronger than your pain, if you just live in Hope." I have 99 problems but Love Encouragement Empowerment Peace Blessings and Strength aren't any of them. When I think of my desire to get well, the idea of being “cured” has never been my emphasis. Would it be amazing if one day we are all completely free of Sarcoidosis & severe chronic pain of Fibromyalgia ? Absolutely! But in my quest to live better, I have never focused on a cure as my destination. Instead of focusing on a cure – something I cannot control, I have tried to focus on my potential for living better in each moment – something that I can control, and on building momentum during the good moments and minimizing the bad. It is a formula that often works, and continues to encourage me to keep trying, even if it means I sometimes fail when those days arrives and Sarcoidosis & Fibromyalgia wins out. In my anger and frustration with the many debilitating symptoms and lifestyle disruptions of Sarcoidosis and Fibromyalgia, I often look for and hope and pray for the quick fix. But if there is one thing I can share today to encourage and inspire those of you trying to make sense of the misery of Sarcoidosis & severe chronic pain of Fibromyalgia , it is this... Focus on the things you can control, and let go of your attachment to the things you cannot. Be realistic by keeping it real with yourself. Understand that you can live your dreams and that you do have a measurable amount of control over your symptoms. By being present and focusing on the variables you can control, you are doing the very best for yourself. Minimizing stress, exercising within your capacity, making a few life changes and especially looking at life with positive eyes and an open heart...Will not cure you of Sarcoidosis & Fibromyalgia , but they will help reduce your symptoms and increase your quality of life. It is just a fact. Living a life with chronic disease and illness is still a life full of potential and possibility, but we have an important part to play to reach that potential for our lives are not over...it is just beginning if you let yourself believe and have Hope and Faith. Small changes can really add up to decreased symptoms and a better quality of life. For we all certainly have a lot to live passionately for, and our lives have positive purpose and we all should intend to continue focusing on the possibilities rather than the pain. Don't pain be the controller of your life. I know I am not alone. There are many of you who feel the same, so for you, this is just a gentle loving reminder of all of our potential and the much more life you have to still live...Never Give Up! And for those of you who need a little more encouragement I offer this: Start small for change happens slowly. This is an uphill battle we are all facing, but each baby-step takes us closer to where it is we want to be – as long as we have a realistic view of our destination. The path is bumpy, rough and dusty and there are many obstacles – and even some booby traps – but with dedication and determination, it is passable. Celebrate and build on the little victories. It is so important to stay encouraged, because our bodies give us many reasons to be discouraged. Chose to focus on the potential, not the pain. Understand that even with improvement, the bad days will still come. It is simply a fact of a life with chronic illness – one of the facts we cannot change, so slow down, accept the setback, and prepare yourself to move forward again once you are able. 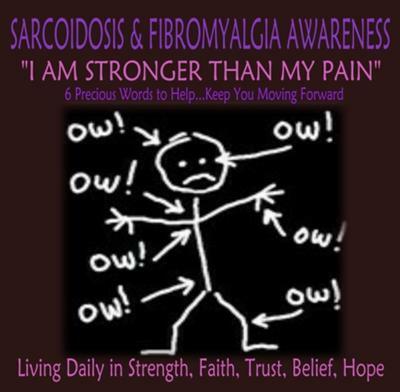 Sarcoidosis & Fibromyalgia is not a static condition. It changes and fluctuates constantly. Know that no matter how bad you are feeling in any particular moment, there are better moments ahead. Pain of today does not reduce your potentials for tomorrow. Live a Life of Positivity Strength & Encouragement in spite of your illness and pain. Everyday I tell myself that "I am stronger than my pain" and in those 6 simple words I find the strength to keeping moving forward. Your past misery should be your current ministry and there is a Ministry within each of us. For many of us that ministry is the gift of encouragement and empowerment. Whether you are a man or woman, young or old, you and your experiences and testimonies can encourage someone else on this difficult journey of chronic illness. God input messages daily upon my heart as he provides me with a Shining Light to Inspire, Motivate, Uplift, Inspire, Empower and Encourage others and the Joy that comes from touching others with a part of Him is a Blessings. 2 Cor. 1:4 says: "God comforts us in all our affliction so that we may be able to comfort those who are in any affliction with the comfort with which we ourselves are comforted by God." Encouraging others encourages me. It does make me feel good to know that I've brought a small piece of joy from God the Father to someone else and perhaps alleviated a bit of their pain for awhile. God says we are to "bear one anothers' burdens with long suffering and so fulfill the law of Christ" (Gal. 6:4). That is why we are here--to love one another, for love is the only thing that lasts. Let's work together to uplift, encourage and build up one another and help each other to be strengthen the Body of Christ as we reach out to those in pain with the love of His heart. God please put me on someone's mind today and put me in the place where I can be a much needed blessing to others and let my words be a powerful healing tool as I use them with loving intention, to uplift, encourage and inspire. God is opening a door just for you for we all have an entire eternity ahead of us to experience more than we can ever dream or imagine for you are capable of rising to your next level....Just Believe! Please Pass Forward to Someone in Need!